Most of our stock is buxus sempervirens (common box), however we also grow the variegated varieties "Elegantissima" (green leaf with a cream margin) "latifolia maculata" (yellow leaf that turns green later in the season) and "suffruticosa" (the dwarf box) as well as other less well-known varieties that are explained in the price list. 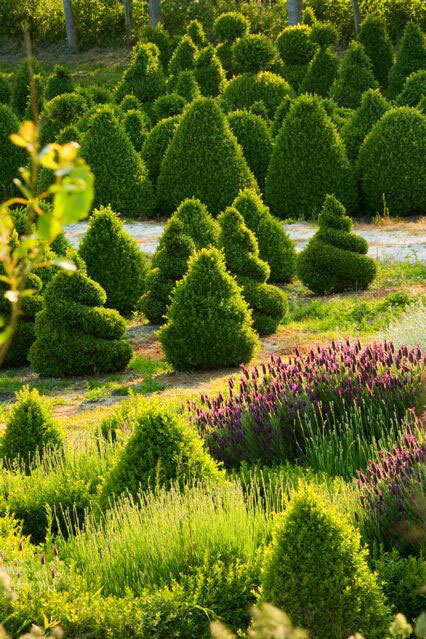 This "growing guidance" applies to all species of buxus. When To Plant: The best time to plant box is at the end of summer/ beginning of autumn when the ground is still warm, however bare root stock may be planted through out the winter until the early spring provided the ground is not frozen or waterlogged. Potted stock can be planted all year provided the ground is not frozen but care will have to be taken in hot weather until the plant is established. Where To Plant: Box is happy in sun or semi shade and will tolerate most soils but will not tolerate water logging. If you have water-retaining soils such as clay, organic material dug into the planting area will aid drainage. Feeding: It is worth remembering that a healthy plant is much less susceptible to diseases and pests. When planting add blood fish and bone or a slow release fertilizer and organic matter. Feed all specimens and hedging in spring with a slow release or blood fish and bone. Fertilize around the drip line taking care not to scorch the leaves with the fertilizer. A liquid fertilizer such as VITAX 20-20-20 can be used 2/3 times during the growing season and especially after clipping to maintain colour and vigour. Clipping: Clipping should be undertaken after the last frost and before the end of June, in order not to scorch the under leaves with frost or sun and to better maintain the shape. A further light clip and tidy in autumn will keep it looking good throughout the winter. If it is possible it is best to cut in the early mornings, evenings or during or just after rain. It is very important to be hygienic and pick up and burn the clippings, cut out dead wood and remove any build up of leaves from the centre of the plants. Containers: Box will grow happily in containers but will take some maintenance. The container should be several centimetres larger than the root ball and even more for bigger plants. The compost used in containers should contain loam, peat and coarse bark. I think a john Innes No 3 mixed with some course bark chippings and a slow release fertilizer is best. In spring add fertilizer preferably slow release to the pot, loosen up the surface of the compost and add topdressing. A foliar feed such as VITAX 20-20-20 may be used up to twice a year, on bud break and after clipping to promote colour and growth. Your plant will rely on you for it's water especially as box is a dense plant and rain will find it hard to penetrate the canopy. The General rule of watering box is to water well during the growing season but do not over water and water sparingly in the winter but don't let pots dry out. If you have been watering and feeding and you notice your plant turning a yellow/brown colour your compost has probably become tired. Either plant into a bigger pot or during the winter, root prune one third and replace with fresh compost and fertiliser. Rust: Red/orange pustules on the surface of the leaf most active in the winter during cold wet spells. Treat the rust with a rose clear or other brand name rust products. Spider Mite: Appears at first as very fine white lines on the leaves where the pest has eaten the chlorophyll, in epidemic cases the leaves turn dull, dusty and chlorotic (yellowy). Treat in late May early June as the young adults emerge and repeat every 10-14 days until infection has cleared. Box Psyllid: Similar to white fly, causes leaf cupping and appears in late spring as a result of sucking nutrients from the leaves most of these unsightly leaves will be removed by clipping. Psyllid nests which look like small balls of cotton wool appear earlier in the year and can be sprayed with Malathion or Murphy's systemic spray, but this is only really necessary for boxwood which is not destined for clipping or in times of heavy infection. Box Blight: There are two dangerous fungal boxwood diseases Cylindricodium and Volutella. Both known as box blight, Neither has a fungicide available to the general public which is 100% effective. It is therefore advisable to keep plants as healthy as possible and buy quality disease free stock.